STEP 1. One philosophy that I think holds up well in the research is the concept of replacement. By that I mean, there are hormones and key enzymes and antioxidants that should be replaced to youthful levels if missing in order to optimize general physicial and mental health. Examples abound and include many hormones, antioxidants such as CoQ10 and digestive enzymes as well. Again, the idea of replacement means, by definition, to youthful levels and not to the supraphysiological levels of steroid users or supplement megadosers. Now there are many other what I would call more "minor"symptoms, such as poor workout recovery, decreased facial hair, poor sleep, "hot flashes", etc. But the above list are the most common and the most debilitating from what I have seen. (There are some dangerous side effects of low testosterone such as anemia and bone loss, but most men have not been tested for these initially.) In my case, I had ALL of the above symptoms when I hit my late 40's, but you may have only one or two. I finally asked my doctor about this and got tested after years of suffering. CAUTION: Notice that all of these seven of the signs of low T can have many other causes. There is no guarantee that testosterone is the root cause. b) Testosterone and Estradiol Testing. If you have any of the above symptoms, get your testosterone and estradiol (ultrasensitive) pulled. It's inexpensive and, even if you are not low T, you've got a nice baseline for the future. If you can afford it, pull free testosterone and/or SHBG as well. c) Choose a Hypogonadism Threshold: Most of the labs still consider ~280 ng/dl to be hypogonadal. The one exception is LabCorp which is currently using ~350 ng/dl from what I understand. Based on what I have seen, men can experience very significant low testosterone symptoms below about 400 ng/dl and some younger men seem to feel it at around 500 ng/dl. You are your doctor have to choose a number where you feel it is "clinical". For me the number where I seemed to experience severe symptoms was around 350.
d) Choose an Estradiol Range. Most of the HRT clinics and anti-aging physicians try to get their patients in the 20-30 pg/ml range from what I have seen. And the reason is simple: generally their patients feel better in that area. The other reason is that there is evidence that this is the safest area based on some research summarized in this Life Extension article. There is one potential exception: Weight Loss. If you are 50+ pounds overweight - and most American men over the age of 40 are - then you can very likely greatly increase your testosterone levels and drop estradiol as well. It is even possible to double your testosterone levels in some cases: see my link on Testosterone and Weight Loss for more information. CAUTION: Low testosterone can lead to many nasty health conditions including anemia, osteopenia/osteoporosis, elevated insulin with prediabetes and/or diabetes, etc. If you have one of these conditions, going natural may not be a good option. 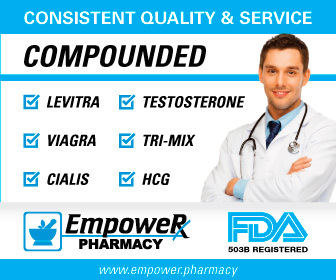 NOTE: Very often Armidex (anastrazole) is given along with HRT, because the elevated testosterone will increase estradiol along with it. NOTE: It is uncommon, but a few savvy doctors will try to diagnose whether or not you have primary or secondary hypogonadism. However, few urologists, PCPs or endocrinologists will do this simply because their solution for both conditions is HRT.